As well as working on big budget adventures, doubling for Bruce Willis in the upcoming "A Good Day To Die Hard" and a regular stunt double for action star Jason Statham, James Embree spent some time on set of Bond's 22nd adventure, "Quantum of Solace". MI6 recently caught up the stunt man to chat about his involvement in the action sequences of the Marc Forster helmed Bond outing. Explains Embree, "My introduction into stunts started out in Canada through a good friend of mine out there, I then got myself onto the British Stunt Register about 7 years ago." Hailing from London, Embree is now a member of the Screen Actor's Guild and Taurus Stunt Academy, an institution renowned for its verbose acknowledgement and praise of the fine stunt work and 'in camera' affects of the Bond flicks. Embree landed the job on "Quantum" after a friend of his recommended the stunt man to assistant stunt coordinator Rob Inch. "I was called by the assistant stunt co-ordinator Rob who was shooting on the main unit at the time, they needed a double for Carl [von Malaisé, Greene's driver] for a bit of driving and part of a shoot out and I had been recommended by a friend of mine to Rob." Above: Bond raids Greene's base in an action-packed sequence featuring Embree. He joined the production team for about three weeks of shooting just after the second unit had completed their boat-chase sequence in Panama: "There was lots or stuff going on because they where approaching the end of shooting and so had units shooting lots of different pieces at the same time, the second unit had just got back from Panama days before so it was all a bit manic." The specific sequence for which Embree was call on was that of the finale, set at Greene's eco-centre in the Bolivian desert. "Mainly I was involved in the shoot out in the underground garage where Bond is chasing the bad guys, he drops down onto the hood of the lead car and kills the guards and chases Greene up into the building, the guy I doubled was driving Greene's vehicle and there where explosions and a shoot out all in pretty close proximity then a foot chase up stairs onto a gantry." 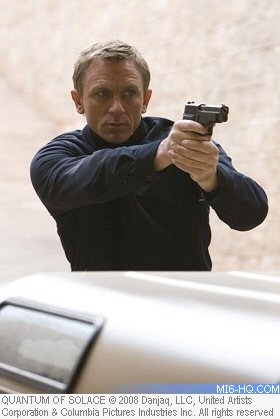 After his brief time on the set of "Quantum" Embree was called back to the Bond universe by Activision, the makers of the 2008 videogame "Quantum of Solace", which strung plot points from Daniel Craig's first two adventures together into one videogame. 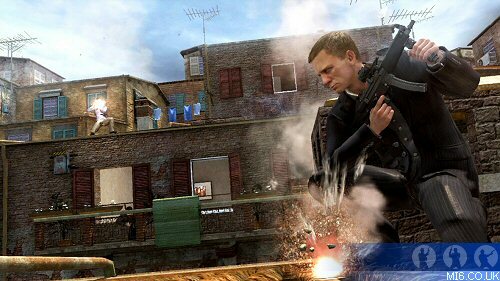 In the game, Embree "did some doubling for James Bond on the game as well as doubling for various bad guys as well." Of the motion capture technology, the stunt man relays: "Doing motion capture can be quite different from general stunt work. Doing a game only your physical movements will be seen, no aspect of your face or even subtle movements will be seen so everything has to be very obvious and deliberate to make the grade."